As expecting parents, idyllic dreams of caring for our unborn children bewitch and captivate us completely. And our muse, in the form of store catalogs and promotional emails, arrive almost daily when one is expecting, hoping to inspire every new parent’s castle in the air. In well-to-do American culture, we call this dream the playroom. A playroom is a place in the home, specifically designated and designed for child’s play. In parental dreams, it is filled with plump, pastel stuffed animals, plush rugs, a rustic toy box, and brightly colored playthings from floor to ceiling. And while the concept of the playroom is often one of those idealized images which is culturally glamorized, the reality of a room filled with toys and boisterous children can be more headache than harmony. The following article will debunk the myth of the catalog-styled playroom and will offer a less expensive and more developmentally appropriate approach to play at home. *Maria Montessori was a 20th Century preeminent physician, educator and child psychoanalyst. Maria Montessori found that children learn best through interacting with their environment. Therefore, Montessori said that schools, and the home, should be kept orderly and attractive to enable kids to maximize use of their playspaces. Playrooms stuffed with toys have the potential to be orderly and attractive, but realistically they require a serious commitment from Mom and Dad to keep them functioning. Young children can help to clean up a few toys at a time, but cleaning and organizing an entire room full of toys is developmentally inappropriate. This fact leaves most cleaning duties to adults. Alternatively, placing a few play items in each room of the home helps to spread out toy chaos and doesn’t necessarily result in children being occupied for less time. Picture fourty-three toys sprawled all over the floor in your main room. Now, visualize three to five toys in each of the rooms you frequent. Which home do you want to spend time in? Montessori thought that order was important because she believed that children are very capable. In fact, she thought that children are more capable than adults are ready to, or patient enough, to allow. Even young children can learn to find and put away things that they want and need. But, they cannot accomplish this if their things are never in the same spot and are scattered all about. Think of how much use that $20 puzzle is if it is dropped into a toy box with a bunch of other random toys. Rather, a puzzle kept in the living room, next to the sofa is accessible, visible and usable. The child can reach the puzzle, dump the pieces out and have no concern about loosing pieces among other play items. She can even put the puzzle back together when she is done because she can see all the pieces clearly. There is no clutter to sort through. Your children will use and learn from toys more in an uncluttered location rather than a cluttered one. The idea of a playroom likely confused Montessori. Why would we limit children’s play to one room of the house? Children like being with adults and often do not want to play alone in a separate room. If your child takes the form of a barnacle on your leg, then he or she is acting in a developmentally appropriate way. Young children are drawn to adults because they have much to learn and gain from interacting with us. They want to watch, talk, engage and play with us all the time. Therefore, expecting a young child to play independently in a playroom while you make dinner can be developmentally inappropriate. Montessori taught that children are keen observers and learn a great deal through watching adults and mimicking our behaviors and activities. For example, it is more beneficial to place a play kitchen near the actual kitchen, rather than in a playroom. When a child observes an adult cooking, they will want to mimic cooking-themed activities. Therefore, displaying kitchen-themed toys near the kitchen will enhance play. To the parent’s benefit, as you consider your already packed kitchen, a playing child is a happy child. As you cook breakfast, you can encourage your child to do the same. This promotes development in various ways and keeps your child engaged so that you can make a healthy meal for your family. Imagine sitting down at your favorite restaurant. You begin to look through the menu, flipping and browsing page after page. In fact, the menu keeps going for 20 pages. After a time, you just order the usual because you feel overwhelmed by the choices. Children can feel the same way in a playroom. Keeping all the toys in one place can cause clutter and over-stimulation in young children. Instead, children can learn to play with a few toys in many different ways, in various locations. This is preferable and improves divergent thought, creative thinking and extends the length of time in which children are engaged. Children with many toys do not play with them all and usually select the same toys each time they play. To help avoid over-stimulation and encourage play with many different types of play items, offer about ten toys at a time. Ten is not a magic number and varies from child to child and developmental stage to the next. *Click here to visit my step-by-step toy rotation guide. Perhaps you are wondering what you should do with your beautiful, well-stocked playroom. I advise dividing up your toy supply so that each room has a few of the toys. If you are ambitious, you can consider developing a toy rotation system, as this is the most helpful way to reduce over-stimulation and promote the organization of toys. Then, use your playroom for gross-motor play (meaning big body movements). 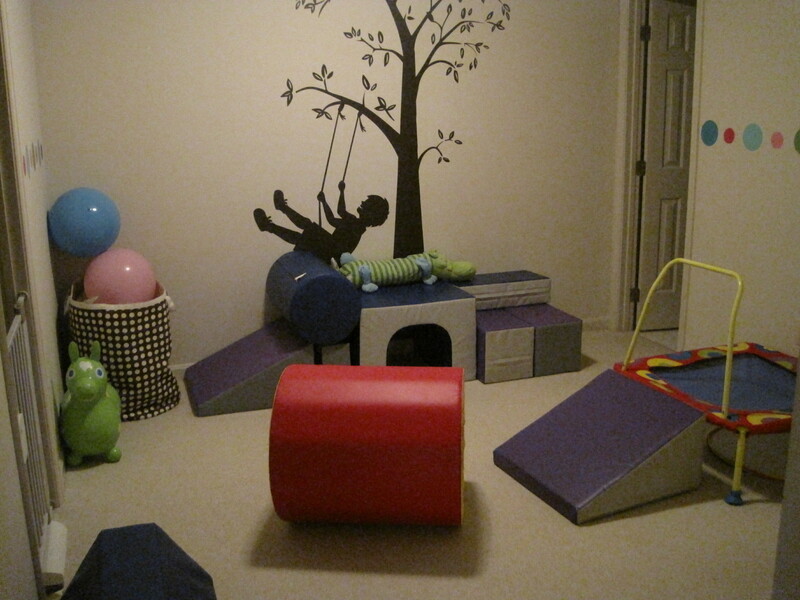 Designate your playroom as a place to run, jump, roll, throw, wrestle, tumble, hide and seek. How wonderful to have a place to send a child who wants to throw toys. If you have extra cash to invest, I suggest buying soft play equipment known as “climbers”. For more budget-friendly options, you can also stock the playroom with a small trampoline, collapsible tunnel, balls, pillows, a large cardboard box, foam padding or or an inflatable baby pool filled with balls to encourage gross motor play. Decking out a gross-motor playroom is workable for budgets ranging from $100 all the way up to $1,000. For more ideas and product suggestions, you can also visit Intelligent Nest’s Toy Recommendation Guide or Amazon Toy Store. To play is to live and to live is to play! Great ideas for a well organized play room! Play rooms with gross motor activities are nice to have on really hot or cold days, when you can’t go outside. Where are those soft play shapes from? You can buy a small set for very young children on Amazon or use Creativity Institute to buy the large “play forms.” Check out my Toy Recommendation Guide for links to the products. Thanks for reading!